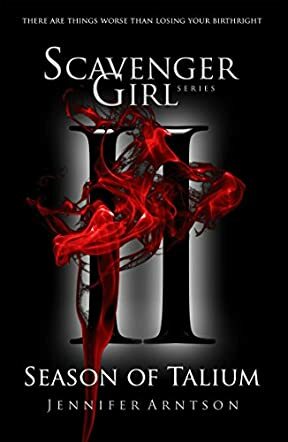 Scavenger Girl: Season of Talium by Jennifer Arntson is a gripping young adult fantasy with a fascinating setting and strong characters. The season is Talium in the world of Ashlund and it's a horrible one. It's constantly dark during this season. It is also cold, and the most vicious creatures come out to reign over the darkness. It is the time that Scavengers do things inside the house. Una is a Scavenger and this season of darkness could have been the best opportunity for her to bond with her family before her betrothal to Blue becomes complete. However, instead of the protection she expected to enjoy at home, she finds herself fighting for dear life, and things only get more complicated when she finds herself in the hands of the Authority, no place for a Scavenger. With newfound skills, can she escape from enemies so strong and determined, and can she find help in the darkest hour? This is a novel that explores differences in class, the supernatural, and what it takes to survive in the face of stiff oppression. The conflict is phenomenal and well developed and it moves the story steadily forward. One of the things I look for in writing is the voice and Jennifer Arntson has a well-honed, clear, and confident narrative voice and it combines with the excellent prose to provide huge entertainment to readers. Her characters are likeable and real and the development arc comes across through the ingenious storytelling in a clear manner. Scavenger Girl: Season of Talium will entice you with its setting, hook you with the conflict, and keep you longing to know what happens next after each surprising turn.